While typefaces themselves are not protected by copyright, their use is frequently an essential trademark element. MLB apparently claimed that Morris Levin’s deliberate invocation of the nation’s pastime, combined with his use of copycat lettering and color combinations, constituted trademark infringement. And, as the Smoking Gun noted, even Hillary’s official favorite teams — the Yankees and the Cubs — were Obamized. I think this is bunk, mixed in with ju-u-u-u-u-ust enough truth. 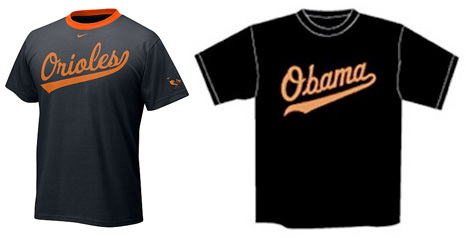 I had a very similar case, where my client’s shirts actually used the names of team cities along with the known team colors plus the style demonstrated above, but here “Obama,” not “Baltimore,” is what’s on the shirt. So I ask you: Does Major League Baseball own every color combination utilized by a major league team along with “baseball” lettering? Preposterous. Now, in fact, if you look at the shirts over The Smoking Gun, which Susan links to, you’ll see that many of them go much further than the shirts shown above. So this, too, was one of those hard factual cases. Most judges won’t take the time to pick out the infringements from the non-infringements. One day, however, MLB — increasingly my bÃªte noire around here — will pick the wrong patsy. I hope that patsy finds my phone number. To what extent does Major League Baseball stand on firm trademark grounds when it seeks to bar use of the three letter phrase MLB in any and every professional baseball related domain name in which it might appear as in http://www.MLBnews.com, http://www.MLBstuff.com, etc.? Does the nature of the domains use matter; as it’s use to provide baseball news vs. it’s use to sell licensed baseball collectibles?